KANSAS CITY, Kan. (AP) — A Kansas board alleges in a lawsuit that a pathology assistant performed autopsies without the proper oversight. ST. LOUIS (AP) — St. Louis Post-Dispatch columnist Tony Messenger has won a Pulitzer Prize for his series of columns about debtors' prisons in Missouri. FERGUSON, Mo. (AP) — The man who took over as Ferguson's city manager while the St. Louis suburb was still in turmoil after Michael Brown's death has resigned. Mayor James Knowles III said in a statement Monday that De'Carlon Seewood's resignation is effective March 1. Seewood is a finalist for a job in Georgia. MIAMI (AP) — The man who became chief of the Ferguson, Missouri, police department after the shooting of an unarmed black teenager there has returned to Florida. On Thursday, 54-year-old Delrish Moss was named captain with the Florida International University Police Department. The Miami Herald reports Moss will oversee daytime patrol and act as the department's public information officer. CLAYTON, Mo. (AP) — New St. Louis County prosecutor Wesley Bell is wasting no time implementing changes in how the county approaches crime. But so far he's not ready to address his biggest issue: whether to reopen the investigation of the fatal police shooting of Michael Brown in Ferguson. ST. LOUIS (AP) — The son of a Ferguson protester who was found hanging in a tree died by suicide, a medical examiner ruled Tuesday, contradicting his mother's suggestion that he was lynched by people opposed to her activism. ST. LOUIS (AP) — St. Louis County's new prosecuting attorney is shaking up his staff and instituting new policies just two days into the job, his spokeswoman confirmed Wednesday, and a veteran assistant prosecutor who presented evidence to the grand jury after the fatal police shooting of Michael Brown in Ferguson is reportedly among those let go. FERGUSON, Mo. (AP) — Authorities are trying to determine the cause of death for a man who frequently protested in Ferguson after the fatal police shooting of Michael Brown. The St. Louis Post-Dispatch reports that 31-year-old Bassem Masri of Chesterfield died Tuesday after being found unresponsive on a bus in Bridgeton. Someone on the bus tried unsuccessfully to perform CPR. The St. Louis County Medical Examiner's office says there was no trauma and nothing immediately suspicious. NEW ORLEANS (AP) — A 24-year-old man has been sentenced to more than 28 years in federal prison for his role in a slaying and subsequent carjacking. Michael Brown of New Orleans pleaded guilty in February to participating with others in the shooting death of Jacquez Young in June 2015. It was a crime that prosecutors said was related to a marijuana distribution conspiracy. Brown also pleaded guilty in a carjacking of an unidentified victim following the killing. ST. LOUIS (AP) — Authorities are investigating the death of a Ferguson protester's son as a suicide, although a message on social media posted by his mother has sparked assertions that it was a lynching. Melissa McKinnies, who was active in the St. Louis suburb after the fatal police shooting of Michael Brown in 2014, posted the Facebook message, saying "They lynched my baby." ST. LOUIS (AP) — Delrish Moss, who took over as police chief in Ferguson as the town still grappled with the aftermath of Michael Brown's death, is leaving at the end of this month. Mayor James Knowles III said Wednesday that Moss will return to Florida to care for his ailing mother. Deputy Chief Frank McCall will lead the department in the St. Louis suburb until a permanent replacement is named. Text and phone messages seeking comment from Moss and Knowles were not returned. In a story Oct. 6 about the conviction of a white Chicago police officer in the death of black teenager Laquan McDonald, The Associated Press erroneously reported that another black teen, Michael Brown, was killed by a white officer in Missouri in August 2013. Brown was killed by the officer in August 2014. ST. LOUIS (AP) — A new audit found that Ferguson, Missouri, has made significant progress in addressing problems in its municipal court, which drew scrutiny for its treatment of poor and minority people after the fatal police shooting of Michael Brown in 2014. ST. LOUIS (AP) — The Missouri governor's office said Friday it doesn't have the authority to appoint a special prosecutor reinvestigate the 2014 fatal police shooting of Michael Brown in Ferguson, despite pressure from Brown's mother to do so. When LaShell Eikerenkoetter cast her vote for Wesley Bell in the St. Louis County Democratic primary on Tuesday, she took the spirit of Michael Brown with her to the ballot box. A national civil rights leader is joining calls to reopen the investigation into the fatal police shooting of Michael Brown in Ferguson, Missouri. FERGUSON, Mo. (AP) — The charcoal gray suit looked like it was tailor-made for Dorian Jordan's tall, slender frame. He tugged on the jacket lapels a few times, adjusted the perfectly knotted tie, and smiled. "I'm a step closer to my new self," Jordan, 43, said. The last time he had worn a suit, he was 11 and attending an Easter service. FERGUSON, Mo. (AP) — Michael Brown's father and a few dozen other people gathered in Ferguson on the eve of the fourth anniversary of his son's death and rebuilt a makeshift memorial. ST. LOUIS (AP) — A seven-term prosecuting attorney in St. Louis County who gained national attention in his handling of the investigation of the fatal police shooting of Michael Brown in Ferguson lost a primary challenge Tuesday to a black Ferguson councilman, according to unofficial results. A county prosecutor who gained national attention in his handling of the investigation of the fatal police shooting of Michael Brown in Ferguson has lost a primary challenge to a black Ferguson councilman, according to the county's unofficial results. ST. LOUIS (AP) — A Missouri legislator is asking the governor to pardon a man who was sentenced to eight years in prison for starting a fire at a store during a protest over a fatal officer-involved shooting. Democratic Rep. Bruce Franks Jr. said Tuesday that the prison sentence given to Joshua Williams was "harsh." A spokeswoman for Republican Gov. Mike Parson said he was traveling and wasn't immediately available for comment. SIOUX FALLS, S.D. (AP) — When Michael Brown, an unarmed black teenager, was shot and killed by police four years ago in the St. Louis suburb of Ferguson, the incident sparked a national debate over the importance of officer accountability. NASHVILLE, Tenn. (AP) — As high-profile police shootings of unarmed black men prompted protests around the country, the Rev. Frank Stevenson was bothered by what he saw to be a growing divide. It was 2015, and the outrage over the killings of men like Eric Garner in New York City, Michael Brown Jr. in Ferguson, Mo., and Walter Scott in North Charleston, S.C., had spread to Nashville in the form of protests organized by anti-police brutality activist movement Black Lives Matter. ST. LOUIS (AP) — The federal judge overseeing a reform agreement between Ferguson, Missouri, and the U.S. Department of Justice said Tuesday that she has seen substantial progress in efforts to eliminate bias in the St. Louis suburb's law enforcement system. U.S. District Judge Catherine Perry heard a quarterly update on progress in Ferguson, where the fatal police shooting of Michael Brown was a catalyst for the Black Lives Matter movement. ST. LOUIS (AP) — Eight police departments in St. Louis County are joining forces to equip about 260 officers with body cameras. ST. LOUIS (AP) — The mother of a black 18-year-old whose shooting death by a white police officer touched off protests in Missouri is considering running for Ferguson City Council. 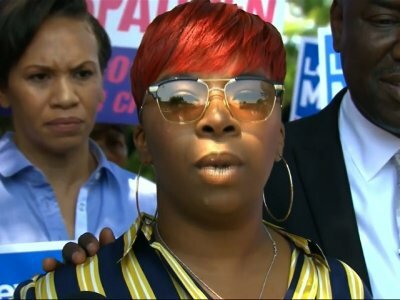 Lezley McSpadden, the mother of Michael Brown, said Monday night during a panel discussion at Harvard University that several people encouraged her to enter the election. Brown was shot in Ferguson in August 2014, prompting protests and a national discussion on race relations and police. The officer wasn't charged. CAMBRIDGE, Mass. (AP) — The mother of Michael Brown and the maker of a documentary about his death will be speaking at Harvard University. Brown was an unarmed, black 18-year-old when he was fatally shot by a white police officer in Ferguson, Missouri. The officer was not charged. Brown's death touched off widespread protests and a national discussion about race relations and police. NEW HAVEN, Conn. (AP) — The Connecticut chapter of the NAACP is holding its first criminal justice reform summit to call attention to the disproportionate imprisonment of African-Americans. The "Nothing About Us Without Us" event began Friday and is set to continue Saturday at Hillhouse High School in New Haven. A man who police say was fatally shot by his mother Wednesday night on the Northwest Side has been identified by the Bexar County Medical Examiner’s Office. Jared Vincent-Michael Brown, 31, was fatally shot once in the chest at about 9:30 p.m. in the 7000 block of Valley Trails, according to preliminary information from the San Antonio Police Department. Devon Akmon was moved when the head of the Ferguson Commission, which investigated the 2014 police killing of Michael Brown, called on museums in a Philadelphia speech to step up after such public tragedies. "He argued what people need more than anything is a place of respite," said Akmon, director of Dearborn's Arab American National Museum. "He asked, 'What if museums opened their doors?' "
It's familiar ground for attorney Benjamin Crump — addressing reporters alongside grieving relatives of unarmed black men killed by police. With each death, the Tallahassee, Florida, attorney has helped lead community demands against a legal system that some believe is blind and deaf to blacks seeking justice. BALTIMORE (AP) — A Baltimore board on Wednesday authorized a city spending plan extending a multimillion dollar contract with the country's dominant vendor of body cameras for police departments. She lay curled in bed for days, paralyzed by the stresses of a life that she felt had chosen her as much as she had chosen it. About three years earlier, the police killing of Michael Brown in Ferguson, Mo., had spurred Ashley Yates into activism. She would evolve from street protester in her hometown of St. Louis to Black Lives Matter organizer in Oakland. The family of Stephon Clark, the 22-year-old black man shot and killed by Sacramento Police, will be exploring "every legal remedy possible" in search of justice, according to their attorney Benjamin Crump. Speaking to CNN on Sunday, Crump said Clark's death should not be "swept under the rug." Crump also called for accountability from both sides. FERGUSON, Mo. (AP) — Ferguson voters will decide next month whether to raise property taxes to continue funding programs at the city's small library downtown. Prior to 2014, the Ferguson Municipal Public Library had few offerings. Then, national attention turned to the city after the shooting death of 18-year-old Michael Brown by a police officer on Aug. 9, 2014, which spurred protests and unrest. ST. LOUIS (AP) — Ferguson, Missouri, is making progress toward racial reforms but risks falling behind if additional staff isn't hired to implement new policies, the court-appointed monitor overseeing the city's agreement with the U.S. Department of Justice told a federal judge Tuesday. Monitor Natashia Tidwell, a Boston attorney, told U.S. District Judge Catherine Perry that new police and municipal court policies are being established, but putting change into practice is happening too slowly. ST. LOUIS (AP) — A Harvard Law School professor whose past clients include the family of the 18-year-old fatally shot in 2014 by a policeman in Ferguson, Missouri, has joined the prosecution team in the criminal case against Missouri Gov. Eric Greitens. Moments after Serena Williams won her seventh Wimbledon title, she proudly raised her fist in a black power salute. A Missouri House member from St. Louis is making a symbolic statement during the Pledge of Allegiance. Democrat Bruce Franks Jr. stood with his right hand raised in a fist Wednesday while most of his colleagues held their hands over their hearts on the opening day of the legislative session. CLEVELAND, Ohio -- Attorney Peter Edelman will discuss the relationship between poverty, race and the criminal justice system during today's City Club of Cleveland discussion at noon. Edelman, a Carmack Waterhouse professor of law and public policy at Georgetown Law Center, is the author of the book "Not a Crime to Be Poor: The Criminalization of Poverty in America." ST. LOUIS (AP) — The city of Ferguson, Missouri, is reviewing nearly 8,000 municipal court cases from before 2014 to determine which should be thrown out, a process expected to take about six months, the attorney for the St. Louis suburb told a federal judge Tuesday. "For Ahkeem" takes viewers and plunges them dead center into an all-too-familiar story.